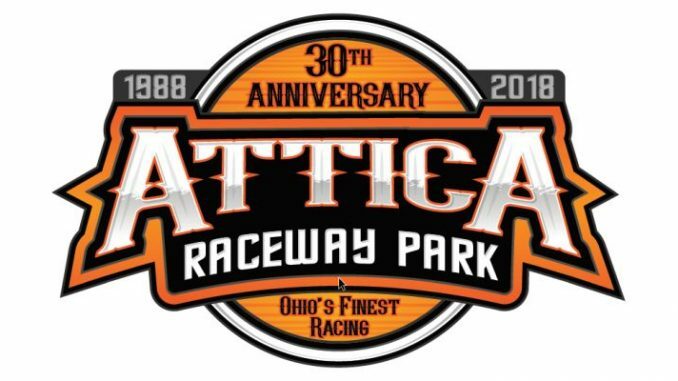 ATTICA, Ohio – It’s hard to believe but there are only four races left in the 2018 season at Attica Raceway Park as “Ohio’s Finest Racing” venue gets ready to wrap up its 30th anniversary season with several big events. The point battles for the coveted Attica Raceway Park crowns are tight in all three divisions – the Callie’s Performance Products 410 Sprints; Fremont Fence 305 Sprints and Summit Racing Equipment UMP Late Models. “We have two point races left and one is double points. That means every position in the feature is very important. It’s going to be an exciting wrap up to a very successful season,” said Rex LeJeune, Director of Operations at Attica Raceway Park. It all begins Friday, Aug. 17 on UBS Financial Services/Central Ohio Farmers Co-Op/Smith Family Foods Night. It will be the final appearance of the season for the All Pro Aluminum Cylinder Heads FAST 410 Championship Series Presented by Ohio Logistics and the JLH General Contractor FAST 305 Championship Series Presented by Engine Pro. The Summit Racing Equipment UMP Late Models will also be in action. Attica Raceway Park will crown its sprint car champions on Kistler Racing Products/Jon Wright’s Custom Chrome Plating Presents the Mark Keegan Classic, Friday, Aug. 24. Double points will be on the line for the Callie’s Performance Products 410 Sprints and Fremont Fence 305 Sprints. And, for the first time in many years the mini-sprints will be in action. The season concludes with the traditional Attica Ambush on Friday, Aug. 31 and Saturday, Sept. 1. Friday’s event features the Arctic Cat All Star Circuit of Champions battling for $5,000 to win with the late models going for $2,000 to win and double points to decide the division’s champion for 2018. On Saturday All Pro Aluminum Cylinder Heads Presents the All Stars competing in the Dirt Classic Ohio for $5,000 to win and a chance at the golden ticket for the Dirt Classic at Lincoln Speedway in Pennsylvania set for Sept. 22 and paying $25,000 to win. The 305 sprints will also be in competition Saturday. The Arctic Cat All Star Circuit of Champions have appeared at Attica 119 times in the track’s 30 year history. In 2018 All Star winners have been Jac Haudenschild, Cale Thomas and Paul McMahan. For more information go to www.atticaracewaypark.comor follow the track on Twitter @atticaracewyprk or on Facebook at www.facebook.com/atticaracewaypark and Instagram at attica_raceway_park.